In stock 3 pcs. Also available in our walk-in store. 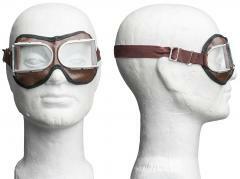 A pair of purpose-built goggles for motorcyclists! These are Soviet manufacture from ages past, and most seemed to be in factory condition, meaning there might be rust on the metal and filth on the lenses. Lenses made of glass, with a theoretical possibilty to change them by prying some metal open. 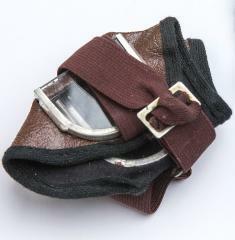 Frame made of vegan-compatible pseudo leather, and, astonisghingly, an adjustable and elastic neck band. These actually provide a pretty good visibility to the sides too, and fold to a flat package that'll fit your breast pocket. Despite how they look in our pictures, these are actually quite comfortable when worn. Might come with a little cardboard box, which might have a cleaning cloth and/or something that might be instructions of use. These might not be included! Of course we can't claim these are real protective eyewear, especially for airsoft, paintball or heaven forbid, any use having anything to do with real firearms. In all reality they should work in their intended use of keeping out wind and insects, but the EU naturally disagrees. 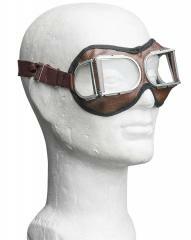 Glass lenses in motorcycling goggles is actually a bad idea, so there's that. 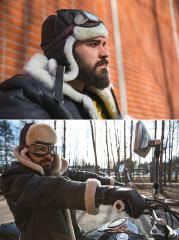 Real deal stuff from the Soviet Union, made during the Cold War and likely just stored away. As said, these might have all kinds of storage wear, so they are not new and shiny. Omistan kyseisen kokonaisuuden tummennetuilla linsseillä. Meh. Ostin omani täydentämään NL tankistin sotasettejäni. Laatuluokka on näillä todella matala, omissa kaikki linssit karusti vinossa, sivulinssit liikkuvat pidikkeissään, ja hihnaa pitelevä naru purkaantuu hitaasti. Käytössä nämä myös huuruuntuvat turhan helposti. NL keräilijöille moneen erilaiseen impressioon sopivat ja näyttävät komeilta vaikka tavallisen SSH kypärän päällä.